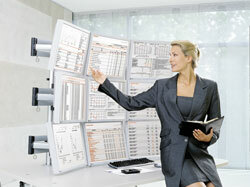 The award winning Tetra Support System (TSS) provides multiple solutions for LCD flat-screen monitors. In addition to providing ergonomically-correct positioning of the monitor, the TSS reclaims valuable space on the desktop. Constructed of high-strength extruded aluminum, the “Tetra” 4-slot posts can support one or many monitors in single-user or multiple-user applications. 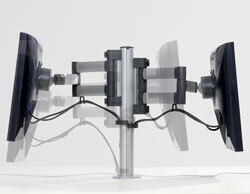 The monitor support arms attach to the posts using heavy-duty steel clamps. Height adjustment is managed through a simple twist of two knobs. 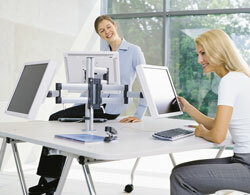 All three arms feature a large ball joint that allows the monitor to swivel in any direction. The Basic Arm can secure any LCD monitor up to 26 lbs., Folding Arm 2 holds up to 11 lbs. and Folding Arm 3 supports up to 22 lbs. Both articulating arms allow easy distance adjustment from 1 to 16 inches with side-to-side movement of almost 180°. A monitor quick release system is optional. Tetra was awarded "Best of Show" at NeoCon® World's Trade Fair 2004 by Design Journal, a leading trade publication for interior designers, architects and facility managers. TSS-609 Standard C-clamp Post 17-1/2"
TSS-639 Standard C-clamp Post 21-1/2"
TSS-209 2-part C-clamp Post 17-1/2"
TSS-239 2-part C-clamp Post 21-1/2"